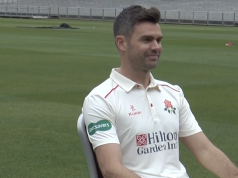 Lancashire are reaping the reward for posting a large total of 494 in their first innings, as they head into the final day of the Roses clash looking to set up a dramatic victory tilt at Old Trafford. Yorkshire batted well in reply to that Lancashire total – which was spearheaded by 19-year-old Haseeb Hameed – as Alex Lees and Andrew Gale hit 85 and 83 respectively to help the White Rose to a solid 360. But, such is the weight of runs Lancashire have on the board, that the total left them 134 runs adrift and put Ashley Giles’ side in position to push for the win on the fourth and final day. Lancashire’s opening pair of Tom Smith and Hameed, who batted so well in the first innings, started positively in pursuit of that aim, closing on 70-0 from 21 overs as the Red Rose took a lead of 204 into what could prove a thrilling final day. Yorkshire resumed day three on 136-2, hoping to chase down the substantial first innings deficit. Alex Lees pushed on from 62 overnight to 85 from 260 balls when he became Kyle Jarvis’ second victim of the innings. 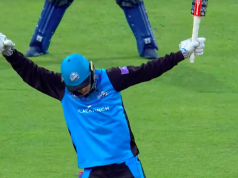 His partner Andrew Gale also put on a gritty show of resilience but was on his way for 83 when Tom Smith had the Yorkshire skipper caught by Simon Kerrigan. That left his side 237-4. Three wickets then fell in quick succession with the score on 272 as Adil Rashid and Jake Lehmann fell in successive overs while just 11 more runs were added before Tim Bresnan was also heading back to the dressing rooms. Andrew Hodd and Steven Patterson though weren’t to be rolled over and frustrated the Lancashire charge with a 58-run eighth-wicket partnership. But when Kerrigan removed Hodd, Lancashire swiftly wrapped up the innings to hold a 134-run lead. Smith and Hameed started in positive fashion and by the close had eased to 70-0 at a rate of 3.33 per over. With a 204-run advantage, Lancashire look like the only side capable of forcing a result, and they will hope to quickly establish an unassailable total in tomorrow’s morning session. From there, on a day set to be fine and sunny, Giles will look to his bowlers to win them the match. 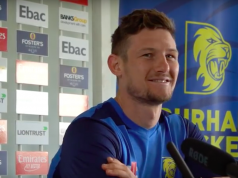 While the draw remains the most likely outcome in this fierce Roses battle, with an in-form Jarvis and a fourth-day pitch for left-arm spinner Kerrigan to exploit, Lancashire will harbour hopes of turning over their old rivals and, in doing so, get their own County Championship campaign back on track.